As a Jackson Hole native, Ariel Mann is one of a lucky few who can claim she was raised in this valley. She graduated from Colorado College in 2004 with a B.A. in Psychology. After traveling extensively around the globe, including living abroad in Spain and attending the University of Granada and the University of Barcelona, she returned to the valley to pursue work in resort hospitality. Ariel enjoyed a successful career as the Director of the Wilderness Adventure Spa and Concierge Services at Spring Creek Ranch in Jackson. She later joined Teton Village Realty as a Real Estate Agent, where her passion for the culture and community of Jackson shined in her ability to find the perfect properties for those looking to call Jackson home. In 2008, Ariel founded JH Wellness, first offering meal deliveries of healthy lunch items to local businesses. She quickly branched the company into all facets of "wellness" – personal training, grocery shopping, catering, cooking instruction, yoga and total body wellness. Soon after, Ariel became an Ace certified personal trainer. As a personal trainer who exuded compassion and optimism, it made complete sense that Ariel make the transition to certified yoga instructor. 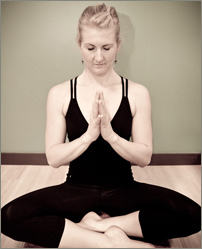 Now with over 500 hours of yoga training, Ariel shares with the community her passion for complete personal wellness - body, mind and soul - through yoga instruction and yoga therapy. Recently awarded Jackson Hole's Best Yoga Instructor by JH Weekly, Ariel offers private yoga instruction at any level and teaches a full repertoire of classes at Inversion Yoga in downtown Jackson Hole, Wyoming. In her Hot, Vinyasa and Maui classes, Ariel shares with students the ancient science and practice of yoga, including specific teachings, programs and techniques scientifically documented to prevent and heal injuries and illnesses of the body and mind. Ariel is perhaps most proud of her certification as a yoga therapist. Yoga, if catered to an individual's needs, can serve as emotional, spiritual and physical therapy and can effectively treat a variety of maladies, including depression and anxiety as well as migraines, diabetes and cancer. With close attention and empathy, Ariel works with a client to develop a workout routine, yoga practice, meal plan or grocery list that fits their individual needs, injuries or ailments. The invaluable services Ariel now offers the residents and visitors of Jackson Hole is a healthy, gentle and fun way to heal the mind, body and soul.